(or, alternatively, the sexed-up account of a small mollusc complete with reference to chemical weapons). Celtic sea-slug traversing empty dog whelk egg cases (August, 2002). Onchidella celtica is commonly known as the celtic sea-slug. It was first identified and described (as Oncidium celticum) in 1817 by Cuvier, from the Brittany coast. It seems reasonable to suppose that Cuvier gave it the species name ‘celticum’ because in latin this adjective describes an inhabitant of western Europe, particularly middle Gaul, better known today as France. 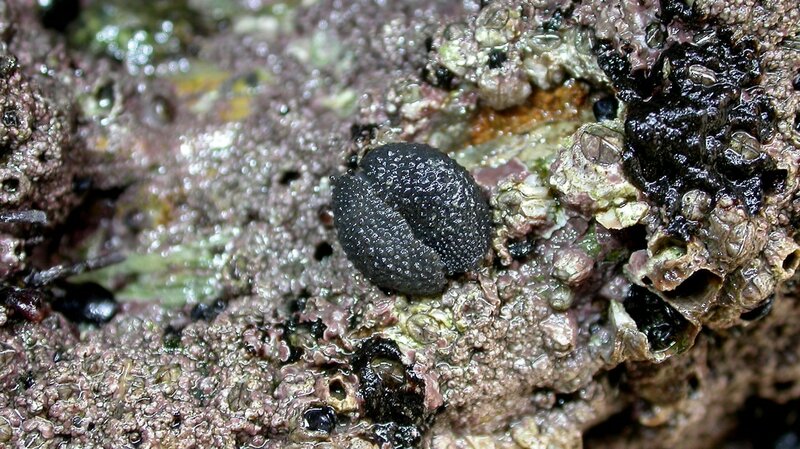 However, ‘Celt’, may mean ‘a warrior’, and with it’s armored appearance O. celtica might be mistaken for something of a warrior, though this little celt keeps a low profile and lives on a diet of small and microscopic algae. O. celtica, like the other onchidiidae, is classified as a marine pulmonate slug and lives intertidally. The pulmonates, as the name implies, have a lung and breath air (latin – ‘pulmo’ means lung). In Britain it’s distribution is limited to the southwest of England, most particularly the south and north coasts of Cornwall, but also at Croyde Bay on the north coast of Devon (according to Tween, 1987). Although classified in with the pulmonate snails it has been argued in the past that the onchidiidae might actually be an early offshoot from another branch of molluscs, that is, the opisthobranchs (Fretter, 1943). This group includes the nudibranchia which are the true ‘sea-slugs’ if we were to apply such a generic label systematically. F.S. Russell (1925), an assisstant naturalist at the Plymouth Laboratory, gave an account of ‘the Occurance of Onchidella celtica (Cuvier) on the Cornish Coast’ in the Journal of the Marine Biological Association of the UK. He noted that it had been seen by Couch at Westcomb and Lanivet Bay near Fowey and at Whitsand Bay, nr. Plymouth, by Spence Bate (places directly opposite the main area of distribution on the Brittany coast). Frederick Russell himself found it on the north coast, ‘on an island rock in the Fistral Bay at Newquay, well provided with crevices and cracks for retreat’. He further noted that the animals occurred at mid-tide and that the whole island where he found them was submerged at high water. So hang on a minute then, we’ve got an air breathing mollusc that can live underwater? Does it have an olympic ability to hold it’s breath until the tide falls again? Is it really covered by water or does it find little air-pockets to live in? Must it somehow swim to the surface to grab a breath? The answers are yes-no-and-no, but the ‘yes’ needs to be qualified because O. celtica can ‘breath’ through it’s skin (or mantle). So although it’s true that it shuts off it’s lung when submerged it can still take in some oxygen through the mantle. In this way it sits out it’s time underwater in a state of relative inactivity as it’s not getting enough oxygen to do much else. In my own visits to north cornish beaches I don’t begin to see Onchidella until April and come November they have disappeared again. So what happens to them? Where have they gone? Do they over-winter in some way? In January 2003 I was lucky enough to observe something which pointed to the answer. Tucked away in an empty barnacle shell at around the mid-tide level was the unmistakeable form of a celtic sea-slug (see below). In the cold winter months from November to March they rarely appear, becoming almost entirely inactive and passing through a period of hibernation (Fretter, 1943). Celtic sea-slug hibernating in an old barnacle shell (January, 2003). Celtic sea-slugs live gregariously in the shelter of rock crevices protected from both strong wave action and sunlight. The numbers vary from 2-3 to up to 60 individuals. You might find them a few feet below high water, down to rocks only exposed at low water. An hour or so after being uncovered by an ebbing tide they may emerge and travel for a little over a metre from their chosen shelter in search of food, or much shorter distances of just a few centimetres. During these excursions between tidal inundations they can move quite rapidly making full use of their lungs by maintaining an open airway. Well before the flooding tide reaches them they will have found their way back to the same shelters they emerged from or ones very nearby. This indicates an interesting homing ability as they do not follow the outward route back. They thrive in damp conditions, requiring almost 100% relative humidity in laboratory studies. In reality they will happily cross areas exposed to direct sunlight but do have a tendency to avoid sunny or windswept areas. So they will emerge, with an empty stomach when uncovered by a retreating tide and forage for diatoms and small algae. Often they are to be found rasping such algae off mussel beds or encrustations of barnacles. While covered by the tide Onchidella will digest the contents of it’s full stomach, however it lacks cellulase and so algal filaments remain largely unaffected. Diatoms on the other hand form a major part of it’s diet and most are digested. A lot of sand and detritus is also engulfed along with bits of sponges and foraminifera. The sand helps to grind the food and as such is a physical aid to digestion. Onchidiidae are also thought to consume another member of the organic bio-film population, that is, bacteria. One of the most notable features of the celtic sea-slug are the papillae spread dorsally across the mantle. Around the rim of the mantle positioned equidistantly are larger papillae. 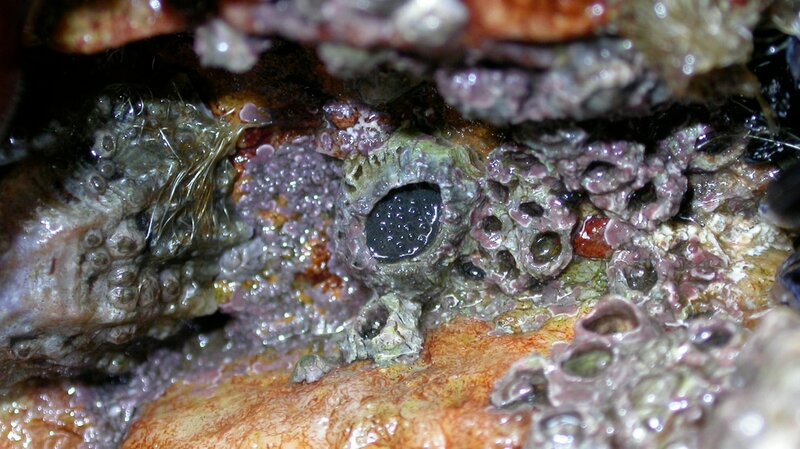 Embedded at the base of each of these, hidden within the thick mantle, are large, flask-shaped, multicellular glands. Potent chemical factories. Linked by a suitable duct to the tip of the larger papillae. When bothered, our unassuming Onchidella will squirt out a spirally coiling stream of white matter said to be highly repugnant to crabs and anemone. Celtic sea-slug, mating (April, 2003). These animals are hermaphrodites that practice reciprocal fertilisation and lay between 60 to 100 eggs. 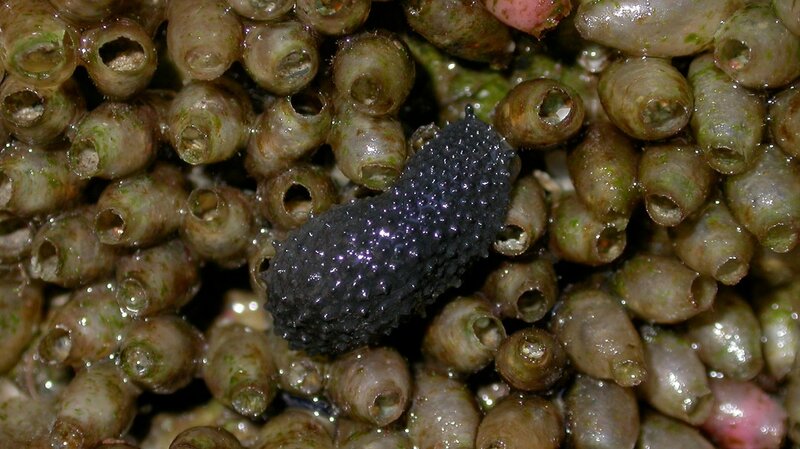 The individual eggs are laid in tubular capsules, the capsules connected by fine strands and coiling irregularly through a jelly mass, about 1cm in diameter and slightly flattened. The eggs are laid in the same cracks that the adults take shelter in and will appear between July and early September. The veliger developmental stages are passed through within the capsule so that at hatching the young look like miniature adults. Development will be slowed by cold temperatures but in captivity those laid in the first week of July hatched at the end of August/early September (Fretter, 1943). Cold temperatures may also increase the incidence of malformations. Newly hatched young are hardly longer than 1mm and are not found with the adults. The smallest recorded in adult clusters were 2.6mm and these were believed to be from the previous season. The question is, ‘Where are the hatchlings?’. Is there some sort of dispersal phase occuring here? If this has inspired you to take a closer look at things next time your down on the beach please remember to tread carefully, check the tides and follow the time-honoured rule of taking nothing but pictures and leaving behind nothing but footprints. Fretter, V. (1943). Studies in the functional morphology and embryology of Onchidella celtica (Forbes and Hanley) and their bearing on it’s relationships. JMBA UK, 25, 685-726. Russell, F.S. (1925). On the Occurance of Onchidella celtica (Cuvier) on the Cornish Coast. JMBA UK, 13, 981-982. Tween, T.C. (1987). On the occurance, ecology and behaviour of Onchidella celtica in the littoral of Cornwall. Thesis, Luton College of Higher Education, 525p. A special thanks to the librarians of the Marine Biological Association, Plymouth, for their help in accessing this and other information. Barfield, P. D. (2003). Notes on the natural history of the celtic sea-slug, Onchidella celtica (Cuvier, 1817). Porcupine Marine Natural History Society Newsletter, No. 13, 10-12. ISSN 1466-0369. © Sea-nature Studies, 2003. All rights reserved in all media.